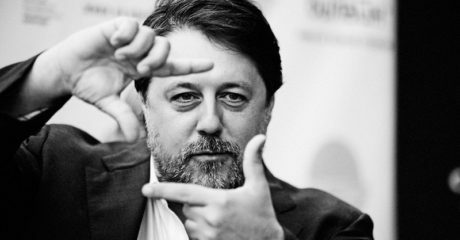 ” In “Close Relations,” subtitled “The Ukraine crisis, my family and I,” prominent documentary director Vitaly Mansky uses the prism of his own extended family to explore contemporary divisions in Ukrainian society over the Ukraine-Russia conflict and to question what constitutes national identity”, Yahoo Moves said. “For Mansky, whose North Korean-shot doc “Under The Sun” is currently in U.S. cinemas, this film is equally full of absurdities, albeit more personal and less strikingly visual than his previous work. Featuring his mother, a sibling, aunts, cousins, and other family connections, it is more humorously home-movie-like, and also more of a gab-fest. Festivals and broadcasters will want to join the family, although additional didactics and graphics could help Westerners unfamiliar with the area’s complicated history”. “Close Relations,” is about the Ukrainian-Russian crisis as seen by Ukrainian-born Russian director Vitaly Mansky’s close Ukrainian relatives in Lviv, Odessa, and Sevastopol/Crimea. The fault lines of the post-Soviet era create cracks in the family that have reached a breaking point with Putin’s military annexation of Eastern Ukraine. In the film, Mansky talks to relatives in Western Ukraine (Lviv), who consider themselves Ukrainian and oriented towards the west as well as those in Russian occupied Simferopol and Donetsk who look at Moscow for support and guidance. ” I was born in 1963 in the city of Lvov, Ukraine”, Vitaly Mansky says in the film synopsis.”This is also where I grew up. Still during Soviet times, I moved to Moscow to study. I had just started my career as a director when the Soviet Union broke apart. I became a Russian rather than Ukrainian citizen simply because I happened to live in Moscow. At the time, it seemed the obvious choice and I didn’t loose much sleep over it. As children of the Soviet Union, we couldn’t imagine a reality in which proper borders would strictly separate the former Soviet republics. By contrast, the vast majority of my family has always lived in Ukraine. They are scattered across the country. Some live in my native Lvov, Ukraine’s Westernmost city near the Polish border. Some live in Sevastopol on the Crimean peninsula. Others have their home in Odessa on the Black Sea and have close ties into the Donetsk region which is now part of the separatist areas. The Maidan uprising of 2013/2014 marked the onset of dramatic change in Ukraine, which of course has affected my family as well. Nobody could imagine that members of the same family will find themselves on the different sides of barricades and become enemies. I will travel to Lvov, to the Crimean peninsula, to Odessa and the Donbass area to tell their story and provide a multifaceted image of Ukraine today. The film will be easily accessible for viewers because I am telling the stories of ordinary people in the pursuit of happiness. They are going to learn about their lives in a country with a complicated history which is now trying to move closer to Europe. This move was the decision of a large majority of Ukrainians – but has plunged the country into a bloody war”. “Close Relations” explores the amusing, intriguing differences of opinion about the fate of Ukraine as it deals with warfare against its neighbor.